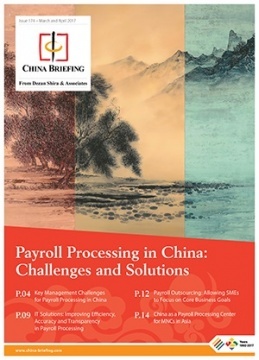 Businesses in China have a diverse array of HR and payroll needs, but what different industries have in common is the need to grapple with China’s complex and idiosyncratic payroll environment. In this issue of China Briefing magazine, we begin by laying out the challenges presented by China’s payroll landscape, including its peculiar Dang An and Hu Kou systems. We then explore how companies of all sizes are leveraging IT-enabled solutions to meet their HR and payroll needs, and why outsourcing payroll is the answer for certain company structures. Finally, we consider the potential for China to emerge as Asia’s premier payroll processing center. Businesses in China have a diverse array of HR and payroll needs whether they are traditional manufacturers employing workers in factories, or young tech startups experimenting with innovative new products and services. Manufacturers may need to schedule and coordinate myriad shifts and production teams around the clock, and calculate overtime and other payments accordingly. Startups may need to establish reporting lines and coordinate payments in an environment where employees are working remotely across a number of different locations and time zones. What these two very different industries have in common is the need to grapple with China’s complex and idiosyncratic payroll environment. Many businesses in China suffer from the rudimentary collection and storage of HR information, while language issues invariably add another layer of difficulty. Even with accurate data, grappling with social insurance rates that vary wildly between cities and provinces, and sometimes even within the same city, makes calculating payments difficult for those unfamiliar with China’s HR laws. In this edition of China Briefing magazine, we provide a roadmap for readers to navigate these issues. We begin by laying out the challenges presented by China’s payroll landscape, including its peculiar Dang An and Hu Kou systems. We then explore how companies of all sizes are leveraging IT-enabled solutions to meet their HR and payroll needs, and why outsourcing payroll is the answer for certain company structures. Finally, we consider the potential for China to emerge as Asia’s premier payroll processing center.